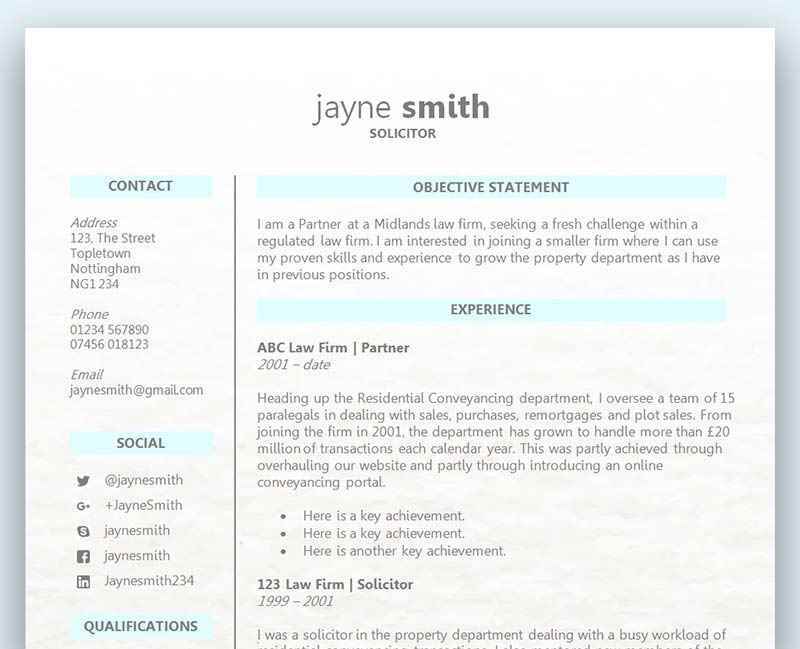 This lovely free professional two-page two column CV template has space for a photo and uses three fantastic fonts: Jenna Sue, Open Sans and Acme. There's a soft grey background that makes the white headings stand out, and some neat font spacing to make them all-the-more attractive. Bullet points are customised to a 'plus' symbol, while the skills list has a simple divider. Accounts and finance free Word CV template	Overall rating:	4.8	out of 5 based on 13	reviews. Be sure to check out our CV editing guide (link below) if you're not sure how to create a circular photo for your CV. Another top tip is to make sure that all the fonts are installed before you open up the template and start editing - otherwise you'll have to apply each one to the appropriate text. Your CV is the one thing standing in your way of an interview, and if you get it right, you could be one step closer to landing your dream job. But how can you make the hiring manager give your CV a second look? There are lots of things an employer wants to see in a successful candidate, and trying to tick all the right boxes can feel like an impossible task. The job advert will give you a great indication of what the company is looking for, but there are some things that must be on your CV if you want to make it to the interview stage. When an employer reads a CV they want to know what that candidate has to offer the role and the company. If you don’t tick all the boxes and are worried that you might not be qualified enough – don’t despair! Instead, write a CV that showcases what you have to offer and don’t worry about any minor details. You must project a positive attitude in your CV and focus upon your achievements. An employer would not want to read a CV that clearly indicates the candidate is aware they are not a perfect match, as any kind of negativity will show a lack of confidence. When the hiring manager reads through hundreds of CVs, they are ultimately looking for someone who is confident in their abilities and clearly shows an understanding of the role and what’s expected. Always write a CV that shows the employer what you can do, and don’t let a few missing skills put you off from making yourself known as a potential candidate. Your CV has to have relevancy, and focus solely upon what the company is looking for. The job advert will give you most of what you need to tailor your CV, and ensure it highlights the relevant skills and experience. If you hide this information within a generic CV you are going to make it hard for the hiring manager to realise you are a great candidate. Everything you add to your CV has to make the employer notice how matched you are to the role, and you can achieve this in a number of ways. Firstly, ensure your work experience section focuses upon the most recent and relevant roles. An employer will not be too concerned about your first job as a waitress, if ten years later you are now applying for an accountancy position. Secondly, make sure the words and phrases you use align with the job advert. If you already have a CV with a list of ‘core skills’, these will probably need amending to suit the employer. We don’t of course mean that you pretend you have certain skills, but what it does mean is that the same skill could be described in a number of different ways. So take note as to what keywords have been used by the employer and match those words to ensure you are on the same page. An employer wants to get a sense that you understand the business they are in, and have a grasp of how the company ticks. Your CV should contain the relevant industry jargon and match the culture of the business. The hiring manager can easily tell from the many CVs they read who knows their stuff and who doesn’t, and even if you are an expert in the field you have to make sure the reader knows this from your CV. Again, look to match the keywords and phrases the employer has used on their job posting, but also review their website and social media pages to get a better understanding of how they speak to their customers, what their goals are, what their values are, and to get a general feel for the company’s culture.